Autumn has officially arrived to the DC area and with it comes the urge to keep warm and relax with friends and family. What better way to accomplish both than by gathering together around your home’s fireplace? Whether you’re enjoying a quiet night in by yourself or hosting the neighbors for the big game, a beautifully designed fireplace creates the perfect backdrop during the fall and winter months. An all-brick fireplace or simple painted mantel might be what you currently have in your home, but if you’re ready for a change there are plenty of stylish alternatives to consider. Whether your tastes are traditional or run towards more modern designs, there is a fireplace that will complement your personal ascetic perfectly. 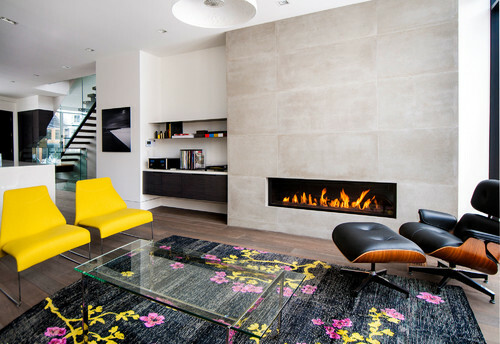 Using a stone slab on this fireplace provides a modern twist on an otherwise traditional living space. 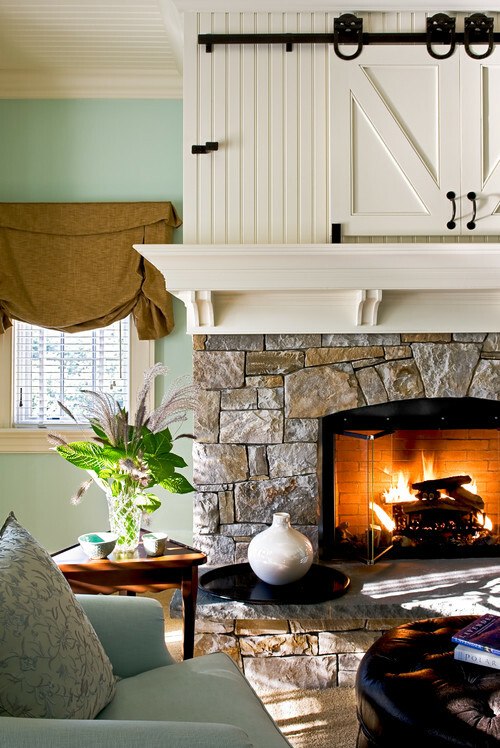 Depending on the color and natural variation of the stone, the feel of this style of fireplace could vary greatly. Another variation of the slab fireplace is to have a skim coat of concrete applied to the surface of your fireplace. 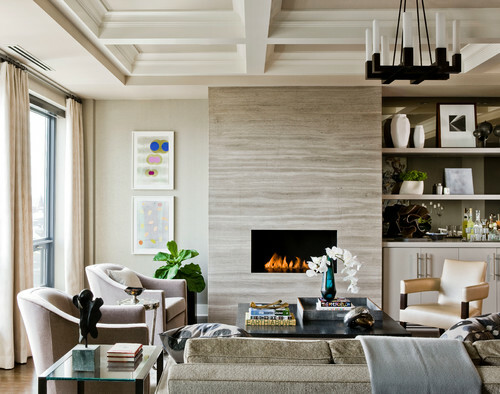 This works particularly well with the minimalist lines of a more modern fireplace, but replacing the hard lines with gently curving buildout softens the look to fit in a more transitional style home. If you prefer the look of a traditional fireplace with some modern touches, a custom-sized inset designed to fit your television is a functional upgrade. Painting the mantel a moody, dark gray not only is a refreshing twist on the more traditional white painted mantel but also helps to disguise the television when it is not in use. Another great way to design a beautiful, multipurpose fireplace is by incorporating sliding panels to hide a television. The combination of barn door hardware, beadboard, and stone work in the fireplace above blend together to create a rustic, relaxed style that is perfect for more casual homes. If a beautiful, stylish new fireplace in your DC area home is something that has been on your wishlist, now is the perfect time to make those dreams a reality! Give us a call today to schedule your estimate.